Recreational therapists often have particular areas of specialty. For example, some work with veterans that have had amputations. These therapists may take the veterans kayaking with special adaptive gear to help them realize they are still physically capable of just about anything. Creative art therapists may use painting and sculpting to help kids with autism learn to express themselves. Mental health recreational therapists focus their efforts on improving the patient’s outlook on life. This may be through expressive arts, muscle relaxation or holistic wellness and taking part in fun outings to help the person integrate with his or her family and community. How can recreational therapists help seniors? Many senior living communities offer recreational therapy that helps the seniors maintain as much independence as possible. Residents with arthritis, for example, may benefit from working with a therapist on eating, maintaining personal hygiene and staying active despite chronic pain. Other seniors might feel lonely and need some help getting into social activities – the encouragement of a recreational therapist can be very helpful for these older individuals. You don’t have to have a one-on-one session with a recreational therapist to benefit from the profession. 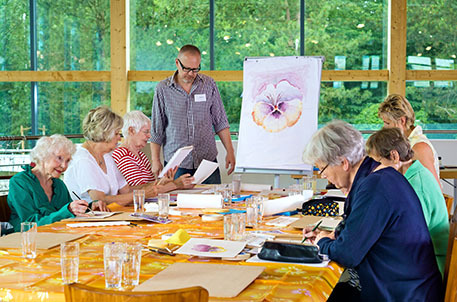 These therapists can also plan outings and activities, like craft days or helping out in a local community garden, that you can partake in at your senior living center as a group. How can I celebrate national therapeutic recreation week? Schedule an appointment with a therapist! You can talk about your moods, feeling detached from your community or family, or even talk about pain that is making regular activities difficult for you. Talk to your senior living community administration about working with a recreational therapist to schedule fun events for the residents. Encourage a family member who could use a little extra help to see a recreational therapist. Perhaps your adult son is dealing with depression or your daughter is having a hard time recuperating after a surgery. These are two great examples of reasons to work with a therapist to help the patient feel more like him or herself. Treatment and intervention through the use of recreation and activities is called recreational therapy. This doesn’t mean that simply getting some rest and relaxation counts as therapy. Instead, a professional therapist often works in places like skilled nursing centers, memory care and senior living communities, substance abuse programs, hospitals and rehabilitation centers. These therapists often work with doctors, physicians assistants and abuse counselors to establish a treatment plan that will assist patients with a myriad of mental and physical issues.